“Therefore I will boast all the more gladly about my weaknesses, so that Christ’s power may rest on me. That is why, for Christ’s sake, I delight in weaknesses, in insults, in hardships, in persecutions, in difficulties. For when I am weak, then I am strong” (2 Corinthians 12:9-10). How would you console a child who got the smallest brownie? 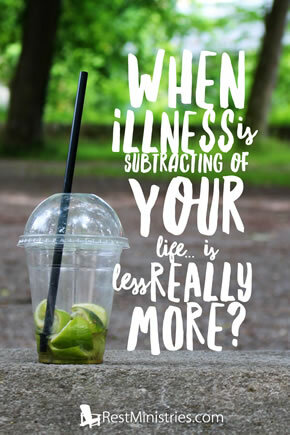 Like me, are you doing less because of your illness or pain? Would it comfort you if someone said, “Don’t be sad! Less is more!”? While others savor their big piece of life, we’re left with a small slice. It might help to consider the “more” times in our lives, and the “less” times. During the “more” times, you probably accomplished a lot. Life was big. Goals were met. You helped many people. You were a doer. That’s what you miss most. In your time of “less” your world has shrunken. Now people are helping you. I consider, what have I lost because of my MS? I teach less and I feel I have less of an impact. What have I gained? I’ve gained more rest. I have more time with my family and friends, more time for a writing ministry, and best of all–more of an understanding of God’s love for me. So I guess my less is more. “Therefore we do not lose heart. Though outwardly we are wasting away, yet inwardly we are being renewed day by day. For our light and momentary troubles are achieving for us an eternal glory that far outweighs them all” (2 Corinthians 4:16-17). God transforms our “less” into His “more.” A waterfall of thanksgiving results! Paul understood how “less” becomes “more”: “All this is for your benefit, so that the grace that is reaching more and more people may cause thanksgiving to overflow to the glory of God” (2 Corinthians 4:15). God’s “more” helps us in our “less.” His waterfall of grace leads to our praise. “The grace of our Lord was poured out on me abundantly, along with the faith and love that are in Christ Jesus” (1 Timothy 1:14). Prayer: Dear Father, Help me not skim over familiar verses like 2 Corinthians 12:9-10. Remind me each day that the less strength I have, the more Yours will carry me through. In my physical weakness, You give me strength needed for the tasks ahead. In my emotional weakness, You restore hope and fill me with Your peace. When others see me, I don’t want them just to see my illness. I want them to see less of me and more of You. In Jesus’ name, Amen. Have you had an experience where you saw God using your “less” for His “more”?